OKLAHOMA CITY – Oklahoma teachers continued to rally Tuesday, shuttering many schools for a second day to demand higher pay and education funding, in an effort that also recently engulfed West Virginia, Kentucky and Arizona. Oklahoma teachers won raises last week averaging 16%, or $6,100 — the first pay increase for some educators in a decade — under legislation signed by Republican Gov. Mary Fallin. But that wasn’t enough to prevent a walkout that brought about 20,000 teachers, students and other supporters to the Oklahoma Capitol. The strike closed the 10 largest school districts in the state, with at least 234,000 students combined. “If I didn’t have a second job, I’d be on food stamps,” said Rae Lovelace, a third-grade teacher and single mother in northwest Oklahoma who works 30 to 40 hours a week at a second job. Teachers are also pushing to restore state education funding to pre-recession levels — which would require its governor and Legislature to reinvest nearly $1 billion more annually. Oklahoma City Public Schools announced classes would again be canceled Wednesday, as the protests and legislative talks continue. “We are hopeful that our legislators will continue working this afternoon toward a solution, but we wanted to make this decision as early as possible to give our families adequate time to plan,” the school district said in a statement. Thousands of people outside the state Capitol were focused Tuesday on getting inside the building to fulfill the Oklahoma Education Association’s pledge to pack the rotunda. By 10 a.m. so many people were inside the Capitol that troopers denied access above the first floor, letting people into the building only after others exited. The building’s capacity is around 1,000 people. Before the crowds thinned out about 1:30 p.m., students, administrators, parents, support staff and teachers cheered in turn, with the cohort of teachers screaming the loudest. “This is our house,” chanted people jamming three floors. Robert Poolaw and Holliebe Collins, who both teach at Thelma R. Parks Elementary School in Oklahoma City, lamented the lack of special education teachers and minority teachers across the state. 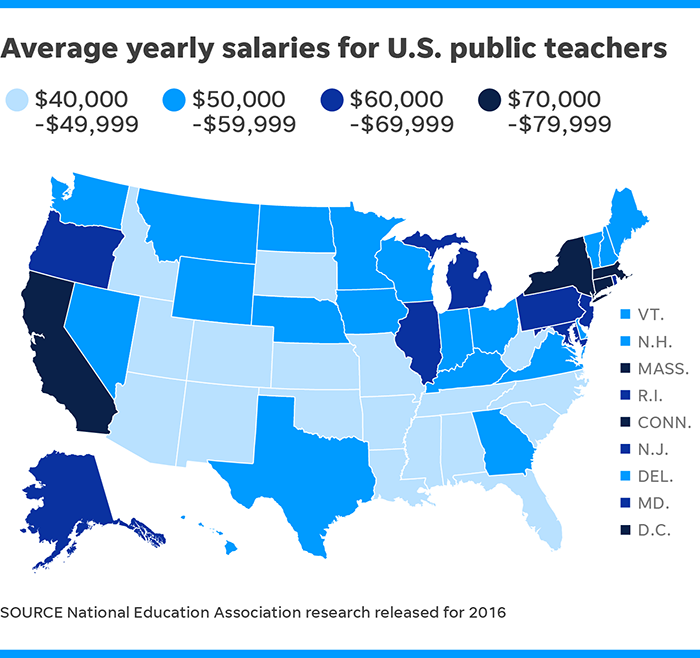 The best teachers leave to make more money in other states, they said. “We have a nurse on our campus one day a week and a counselor one day a week,” Collins said. “Our kids get music for 20 minutes, one time a week,” Poolaw added. Collins and Poolaw said they know they’ll get paid for up to four days of protesting but aren’t sure if they’ll have to use paid time off if the strike goes beyond that. “If it takes all school year, we’ve gotta be prepared to do it,” Collins said. Fallin warned Monday that the state budget was tight and that there are other priorities besides education. “We must be responsible not to neglect other areas of need in the state such as corrections and health and human services as we continue to consider additional education funding measures,” Fallin said. Oklahoma’s average teacher salary of $45,276 ranked 49th among states and the District of Columbia before the raises, according to the National Education Association. The state also ranked 47th in public school revenue per student, according to the teachers’ union. With the schools closed, parents scrambled to place their children elsewhere. The state’s largest district, Oklahoma City Public Schools, is providing free meals at more than 100 locations for anyone 18 and younger. Churches and organizations such as the Boys and Girls Club and Girl Scouts are offering day care or camp-style accommodations. Posted in Accountability, Advocacy, Educators Protest, Funding For Education, Pension & Salary and tagged "Standing Strong for Public Education", #iBelieve, Accountability, Advocacy, Diversity, Education, Equity, Failing, Failing Schools, NEAExecutiveCommittee, Pension, Pensions, Public Education, School Choice, Students. Bookmark the permalink.